Oooh look. 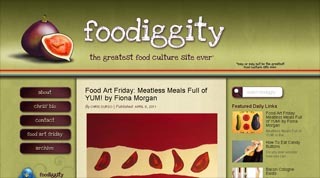 The fun and funky Foodiggity - the greatest food culture site ever* has begun a new Food Art Friday and has been kind enough to feature the art filled vege cookbook. Thanks Chris! Take a peek, or even better, follow along for all sorts of food related entertainment. If you too would like to feature the cookbook project or interview me, please get in touch. I'd love to hear from you. The best thing you can do if you like this project is to spread the word. How Do I Know What Art To Buy?